The injured knee is placed on a leg holder over the radiolucent operating table as post-operative plain X-rays will be taken after the procedure to verify whether reduction and fixation is satisfactory. 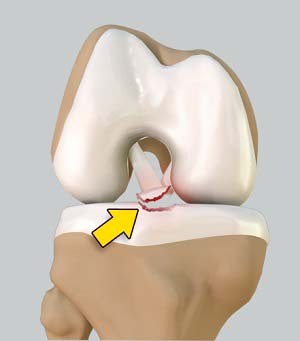 In minimally invasive arthroscopic procedure, tiny incisions are made on the front side of the joint. Arthroscope is inserted through an anterolateral portal (on side) whereas the probe and other instruments are passed through an anteromedial portal (in the centre). The hematoma is evacuated at first using motorized suction shaver. Then the fragments are identified and all soft tissues around them are debrided for complete visualization of the joint. The knee is examined for any entrapped meniscus or intermeniscal ligament and any interposing soft tissue is pulled back so that the avulsion fracture can be reduced with an arthroscopic probe applying firm and gentle pressure.